Time is not on my side. These photos are a little bright (which is in NO way Jennifer/my photographer slave's fault) and it's really because of my lack of free time. See, when you take pictures in the middle of work (while you're trying to write a recap of Walking Dead last minute and your photographer has 9879870 stories to edit), you don't really get to be picky about where you take them or where the best light is. Then when you have classes until 1:00, a lab until 3:30, club meeting until 6:00, and a ridiculous amount of people to email/other work to do, it's a little difficult to find time to edit pictures. It's even harder when you don't really have a great grasp on how to do so correctly, nor the time to learn. So, voila, bright photos. This outfit came together kind of randomly, I really just kept putting things on and hoped for the best. I picked up this sweater at a thrift store for either $1 or $2 and it's one of those pieces that I ended up loving even more when I got home. It's also one of those items that's way too big, but I'm finding ways for it to work anyway. That's how much I love striped sweaters. As for the boots, they're actually not new, despite showing up here for the first time. I bought them a year ago and wore them all last fall, however, when I pulled them out this year, I decided that I hated them. They felt cheap and I started looking for a new tall black pair (because why wouldn't I need a new pair? ), but then decided I try these again before I coughed up the big bucks that all boots cost. They still feel a little cheap, but I decided I like them again. Who knows how I'll feel next week. Or tomorrow. I know what you mean trying to fit in taking photos with busy class schedules; between class, working, and homework sometimes there doesn't feel like enough time in the day; however, I think that these pictures look great. And I'm totally loving that sweater. Before I read anything I thought, wow, I love those boots! So I would definitely say that they are keepers. Great find on the sweater. I love the hard vs. soft of this look with the light skirt and black leather boots. loove the skirt & its shiny, shimmery pattern. 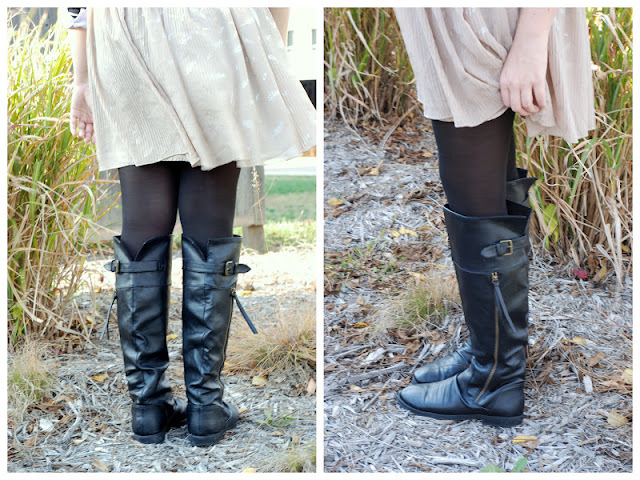 Those boots are fantastic too-- I need to find myself a good pair of boots for fall/winter. Well I happen to like the lighting in these photos Elana! But I totally understand where you're coming from (minus the fact that I don't do the whole outfit photo thing yet!). There never ever seem to be enough hours in the day! On the bright side, I think I'm kind-of in love with these boots...and your $1 sweater. Such a great find! you look beautiful, your smile always cheers me up! and your photos look fine, know what you mean about time, im often the same in work and its just a case of grab the photos whilst you can! Ps forgot to say, love those boots!!! Love this layered look so cute! And you have such a great smile! 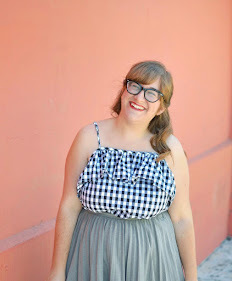 1) I loved this look so much,I pinned it! (finally figured out how the bloglovin' pin button worked. Yeah...let's not talk about how long it took for me to figure it out. Its not flattering...) I ADORE the button up under the sweater and the sweater's relaxed/slouchy fit. It looks like an effortless ensemble. 2) :( about cheap, black boots. They are so indispensable to a wardrobe; it is sad when you feel like they aren't good quality. Gotta say though, these look quite nice! Striped sweaters are pretty much my go to winter staple, and usually I like them the bigger the better haha! Its sounds like you are being kept pretty busy, which I can totally commiserate with right now! I am off put your button up on my blog, hooray! p.s. that ring I forgot to mention, is beautiful!